I made a vegan chocolate cake for Hope’s birthday. I found the recipe somewhere on the internet and changed it a bit. It was delicious. Now, just because it is vegan does not mean it is healthy. But, who wants to eat healthy cake on their birthday!? Preheat oven to 350 degrees. Mix together flour, sugar, cocoa, baking soda, and salt with a fork, making sure it is really blended together. Add the water, vanilla, oil, and vinegar, and mix well. Place in oven and bake for about 30 minutes, or until a knife comes out clean. Cool. Sprinkle top with powdered sugar. Enjoy! After spending a week with my family in Texas for Christmas and watching my younger brother Kevin eat all kinds of healthy foods — brown rice, beans, sweet potatoes, salads, vegetable stews, etc., Dave and I came home and decided to change the way we eat. We watched Forks Over Knives and goodness gracious that documentary kicked us into high gear! Since the beginning of January we have cut out almost all dairy and most meat (we do eat a little chicken and fish…maybe once a week) and stuck with a whole foods, plants based diet. We cook with as little oil as possible and eat more vegetables than I thought possible! We drastically cut our sugar intake. I guess you could call us mostly vegan. Between the two of us we have lost 16 lbs. this month. We feel soooo much better. The first week was hard but each subsequent week has gotten easier. And now, we are enjoying what we eat. I can’t wait for summer when fruit will be perfectly ripe and deliciously sweet and vegetables will be more flavorful. The goal is to avoid high blood pressure, cholesterol, way too many extra pounds, diabetes, etc. Obviously we can’t control everything that happens to our bodies but we can be responsible and do our part to eat healthy. And might I add that my brother Kevin went from high blood pressure, high cholesterol, border-line diabetic and over 300 lbs. to a lean, mean healthy machine by eating this way? His latest bloodwork? Cholesterol: 113. WOW! Disclaimer: We aren’t going to go all weird. If someone invites us over for dinner and serves ribs, baked beans with bacon, potato salad, mac & cheese, and apple pie with ice cream for dessert, we will eat it and enjoy every bite! But, our hope is that we can maintain a very healthy lifestyle at home and only very occasionally eat meat, dairy and sugar. 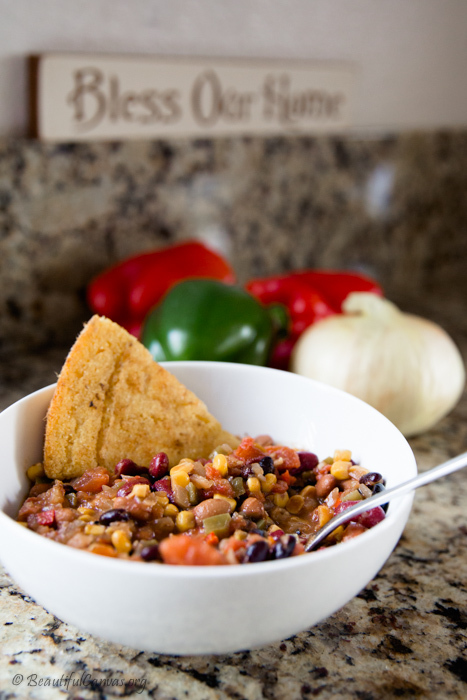 One recipe I have made a couple of times is The Best Vegetarian Chili Ever from the pickyeaterblog. 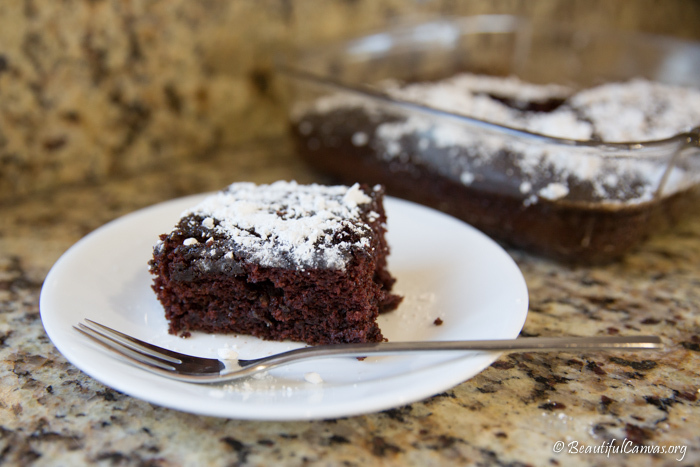 This recipe has cocoa powder in it and a couple of splashes of soy sauce. Might sound a bit strange but all put together, it is very yummy. The first time I made this, we really missed sprinkling cheese on top and adding a dollop of sour cream. The second time, not as much. We’re hoping by the third time, we’ll be just as happy without those things as we would be with them! Wendy from my MOPS group brought fruit with this seasoning stuff on it to Bunco night. I ate and ate and ate. And then the next day I ran to the store to find this magical stuff. It’s a concoction of chili peppers, dehydrated lime juice and salt. It does something wonderful to sweet fruit. 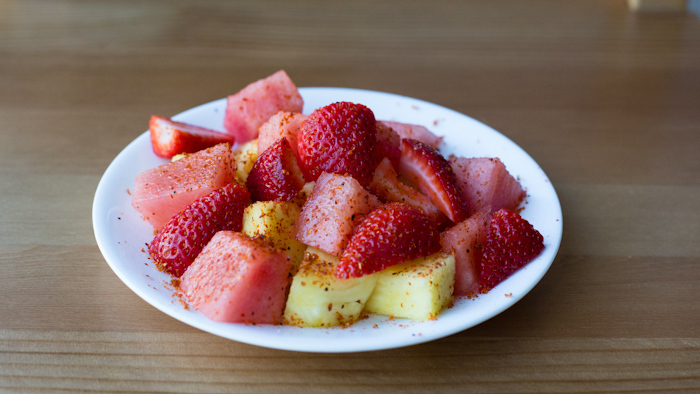 It’s like sweet and sour, sweet and spicy fruit. Good thing I have low blood pressure and my cardiologist said to make sure I get enough sodium in my diet, ha! Wendy chopped up watermelon, strawberries and pineapple for her salad so I did too. I think mango might be a nice addition. Maybe kiwi. 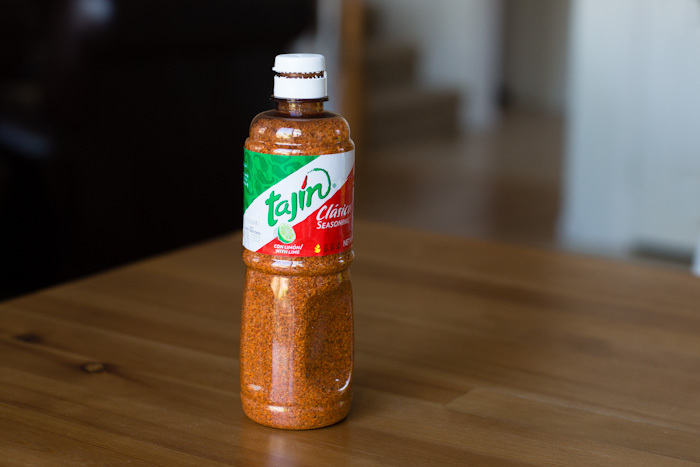 I found the giant bottle at Costco but you should be able to find it in the international food aisle of your local grocery store. Beware, it’s addictive! I can’t stand looking at that hideous spider picture anymore! So, here’s a yummy recipe that is a whole lot better-looking than the tarantula! Preheat oven to 375 degrees. 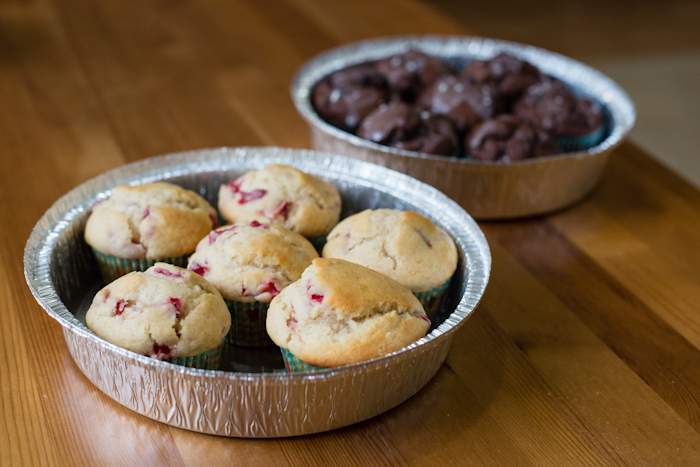 Line an 8 cup muffin tin with paper liners. In a small bowl, combine oil, milk, egg and vanilla. Beat lightly. In a large bowl, mix flour, salt, baking powder and sugars. Toss in chopped strawberries and stir to coat with flour. Pour in milk mixture and stir together. Fill muffin cups. Bake at 375 degrees for 25 minutes, or until the tops bounce back from the touch. Cool 10 minutes and remove from pans. Yesterday I went to the grocery store and they were out of our favorite jarred salsa. Tragic! So, I pulled out my phone and looked up Pioneer Woman’s Salsa recipe. What did we do before smart phones? They are the biggest time-saver and time-waster all rolled into one. Speaking of smart phones, Hope knows how to find Angry Birds on my phone and play it. She also knows how to call people. Apologies to all of you who have gotten multiple calls from our two year old! It’s EASY and yummy. I doubt we will buy jarred salsa anymore. Put everything in a blender and pulse until desired consistency. I like mine a little chunky so I didn’t do much blending. Also, I used one original can of Rotel tomatoes with green chilies and one mild can. And I de-seeded and membraned the jalapeño. 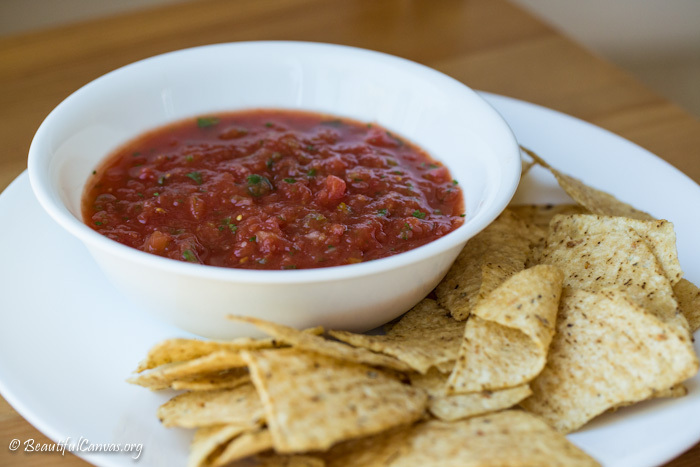 I wanted salsa with just a tiny kick. Next time I might add another jalapeño. And, I added a bit more kosher salt. This makes a very large batch. Next time I might make half.